Brandon Frohne is an awesome young chef who I have been following his career in Nashville from the humble pop-ups he started doing, biscuit making extraordinaire, his rise to FoodTV stardom, executive chef at one of the leading destinations in Nashville, and now making Holler and Dash happen. Back in the early days, Brandon was one of the few chefs in Nashville to really embrace sustainable and local farm fresh foods and local makers. It was so great to go to one of his pop-up dinners because each dish made me feel like a million dollars. I remember one of his dishes was a local breakfast radish dish with micro greens and some cream that was so luscious with the right amount of salt, acid and cream to make me lick the plate. It was a radish dish, and I licked my plate. How many dishes have I made with a radish, and when I wanted to lick a plate? None. Luckily, Brandon knows how to get the best flavor and texture out of anything, including radishes which makes me want more! I bet you I could give him the sole of my loafer, and he could make it taste good. Fast forward to today, Brandon is helping the brand Holler and Dash set up new locations and source much of the ingredients and products from local, local organic, organic, sustainable sources. 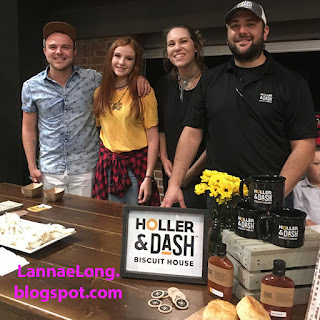 Here in Nashville, the Holler and Dash store has all the good stuff you would get at high end restaurants, but at fast casual prices. Holler and Dash is using Springer Mountain Chicken, Frothy Monkey coffee, Nashville Jam Co jam, Olive and Sinclair chocolate, regionally made kombucha and more! The beverages, holly cow, the beverages, yeah there is the soda machine if you must, but there is also craft sodas like lemon basil which is made to order, and kombucha to make your gut feel happy. The base Holler and Dash menu, the biscuits sandwiches, are some of the best biscuits around. 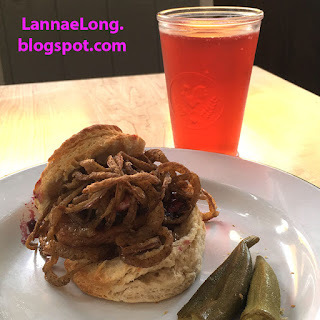 I love the pork biscuit which has pork loin, blackberry jam, butter and onion straws. Here is Nashville, that jam is made by Nashville Jam Company. My next favorite is a chicken biscuit which is a Springer Mountain free range fried chicken breast with goat cheese and sweet and spicy pepper jelly. Holler and Dash is about to open in the Melrose neighborhood of Nashville in the next month or so. The sign is above the door, and the build out is happening now. This is close enough to my work, that I will be hopping on in for my pork biscuit fix. I wonder if this location will register with Uber Eats, so I can have a biscuit and kombucha delivered to my office. I recently grabbed a bite with Brandon, at a new and trendy restaurant in Nashville. Chef RJ came out to say hello to us, and Brandon told this delightful chef that he has been following his career for many years and it was just a pleasure to meet the chef. I was chuckling to myself because I have been following Brandon's career from the time he stepped foot in Nashville, and it is always a pleasure to meet Brandon. When Brandon first got here, he needed a job quick, so he got a job cooking at an assisted living home. It was a time when some of us in my office had to find the right place for our elder relatives to live with some help. Dave, my coworker looked at this assisted living home and had dinner there. Dave really loved the food. There were many families there having dinner with their family member who was a resident there. The food was nutritionally balanced, met dollar amount allotted, and tasted darn good. Those meals were Brandon's creations. Dave and I decided that food service is very important when looking for assisted lived homes. When Brandon was there there cooking, he brought families together at the dinner table. Brandon delivered delicious food to residents, and made their day a little brighter. Brandon created food that brought family members to the table with the residents. The idea of family meal, regardless of living situations, and age of relatives, is still important for keeping families together. Brandon did just that. Then many years ago, Brandon, with the help of a couple friends of ours, started fundraising to get Las Vegas and compete in the World Chef's Challenge at the World Food Championships. Brandon offered a series of pop-ups called Forage South, and raise the funds to get a plane ticket out to the competition. Forage South was all about a great dining experience with local, fresh, organic, and biodynamic ingredients. These dinners had a following. It has been about 5 years since the last Forage South. If at all possible, I would love for Brandon to carve out some time and offer at least one more Forage South pop-up. I would totally volunteer to be his sous chef. These dinners were so fun. After the last Forage South pop-up, Brandon finally had enough funds to get out to Las Vegas, and we all wished him good luck! Off Brandon went to the World Chef's Challenge. Us, back here in Nashville, waited with bated breath for results. With his dishes of eggs, salmon and then duck propelled him to finish really well as a semi-finalist. We all virtually hi-fived Brandon for this great win! It was a joyous time for his friends back here to get the news of the World Chefs Challenge. This win got Brandon noticed back here in Nashville, and he was named Executive Chef of Mason's (at the time) the newly created restaurant space at the luxury hotel Loews Vanderbilt. Brandon remained true to his aesthetic of using great local, fresh, organic, and biodynamic ingredients to bring high-end dishes to the diners at the restaurant and bar. He also traditional flavoring methods such as fermentation pickling to make a surprisingly well appointed burgers with non-traditional pickles that delighted the palate. Then Brandon gets invited to play on Chopped TV show twice, and he gets invited to cook at the James Beard Foundation TWICE! TWICE! You don't get to cook at James Beard without having the chops to do so. Brandon is among good company of other great chef's in Nashville who got invited to cook at at James Beard. It is my hope that one day, Brandon will take time and open his own restaurant, be invited to cook at James Beard again, and the third time will be the charm, and he will get a nomination for James Beard Southeast. Until then, Brandon's friends and I will wait for that time, and totally give a hi-five for the win!